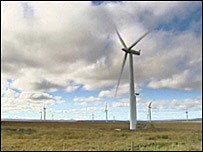 Anti-wind farm campaigners have urged Highland councillors to suspend any further schemes. A number of groups backed the call at a special council meeting held on Wednesday to consider guidelines for future green energy developments. Campaigners accused officials of misleading councillors into supporting wind projects. The authority said its final strategy on future renewable energy projects will go before the full council in May. Bob Graham, of Highlands Against Wind Farms, said wind farms have not brought the "vibrant" economy promised and many jobs building the turbines had gone to overseas workers, including Eastern Europeans. He said: "The politicians will eventually come to their senses, but hopefully before too much damage is done." Once the draft renewable strategy has been agreed it will become the planning blueprint for deciding where renewable energy projects go in the region. More than 500 written representations have been received by the council and public hearings have been held across the Highlands. The strategy will determine which wind farms get the go ahead in the future. The plan being considered also covers wave energy projects, hydro electric and biomass plants. Councillors have to balance the environmental and economic benefits these projects may bring against the impact on the environment and landscape of the Highlands. The draft plan details 11 areas in the Highlands where there will be a presumption in favour of wind farm projects. How are we doing on renewables?